Oxford: Oxford at the Clarendon Press, 1970. 234 pp. Melodies of Peter Abelard and Hildegard de Bingen in the appendix, 27 pp. Dust Jacket with rubbing and two 1-inch tears with attendant creases, price clipped. Contents: I. Poetic Individuality--Questions; II. Ruodlieb--The Emergence of Romance; III. Semiramis--The Creation of Myth; IV. Peter Abelard--Planctus and Satire; V. Hildegarde of Bingen as Poetess and Dramatist; The Text of the Ordo Virtutem; VI. Epilogue--Paths of Further Inquiry; Appendix--Melodies of Peter Abelard and Hildegard (transcriptions by Ian Bent); Index. 'This book has grown out the attempt to analyse the literary implications of a group of texts that . . . I have come to regard as key-texts in the total picture of eleventh- and twelfth-century European poetry. . . . The common problem of poetic innovation and experiment to which these texts contribute inevitably demands constant reference to the realm of inherited literary convention and traditions, of the typical in medieval poetry, which has been adumbrated with such authority and so richly illustrated by Ernest Robert Curtius. 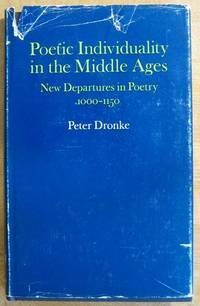 By concentrating on a different mode of appraoch to individual poems, I have attempted in one respect to complement Curtius's great study, to sharpen the focus upon the spontaneity and independence of poetic creation that existed alongside, as well as within, established traditions.' --from the preface.. Cloth. Very Good+/Good. 8vo - over 7¾" - 9¾" tall. London: Routledge & Keagan Paul, 1970. 312 pp. Price-clipped dj w/ 3-inch tear and other wear at top. Sticker ghosts on FEP of otherwise fine volume. Medieval Authors Series. Three photographic plates of illustrations from manuscripts in the British Museum. Contents: General Preface; Author's Note; John Lydgate: The Critical Approach; The Monastic Background; Chaucer and Literary Background; The Courtly Poems; Troy and Thebes; Laureate Lydgate; Fables and Didactic Poems; The Fall of Princes; Lydgate's Religious Poetry; Conclusion; Select Bibliography; Index.. Cloth. Very Good/Good. 8vo - over 7¾" - 9¾" tall. New York: Little, Brown, and Company, 1920. 252 pp. A bit of rubbing to the edges. Spine darkened. All six plates by Eric Pape are present. Also an elaborate jousting scene by Pape on endpapers. Green cloth with gilt-decorated type and ornaments. 'Long, long ago when castles grim did frown, When massy wall and gate did 'fend each town; When mighty lords in armour bright were seen, And stelthy outlaws lurked amid the green And oft were hanged for poaching of the deer, Or, gasping, died upon a hunting spear;' The Gest proceeds in 'Fyttes.' . First American Edition. Decorative Cloth. Very Good. Illus. by Eric Pape. 8vo - over 7¾" - 9¾" tall.